For the most part I felt a lack of interest in the way Harrison presented the material. This is mostly because he seemed more indebted in talking about himself than using anecdotal evidence, which would have been much more interesting. Rather than hear about the time Harrison thought he saw a UFO, explored the pyramids, interviewed Olympic athletes, was a news anchor, and even watched more videos about space than most astronauts (yeah, he went there), I would have rather enjoyed specific examples from history or the news. Anyone but the author himself and how awesome and amazing and more biologically adept he thinks he is. For example, in the chapter about Holocaust deniers, why not explain why they believe it never happened versus that time you felt sad interviewing a Holocaust survivor? If I wanted to read 400 pages of self-congratulatory writing I would have read a memoir. This is not a memoir. Another problem was that I had to slog through a lot of chapters I didn’t care about just to get to the parts I did. I didn’t buy this book to read two sections about constructed versus biological race, nor did I pick it up to read chapters that seemed to repeat themselves back to back. This felt like a huge waste of time and information, especially when more interesting sections were whittled down to only four pages. Three chapters on biological race and its fallacies, and a chapter on creationism and another on intelligent design seemed like they could have been condensed into one chapter versus several. The same can be said of each chapter on medicine other than scientific (alternative and homeopathic), where I just felt like the same information was being constantly reiterated. That’s not to say that this book wasn’t interesting. I generally like non-fiction because the real can be more fantastic than the imagined. Without reading this novel I wouldn’t have discovered interesting tidbits such as: 41% of Americans believe in Atlantis, 18% of Americans think the sun revolves around the earth, 40% of Americans believe in creationism, and 42% of college students will never read another novel for the rest of their lives after they graduate. This last statistic probably horrified me the most considering the obvious love and reverence for reading we have on this blog. Although the statistics about creationism and the sun are disturbing, it probably pains scientists way more than me. 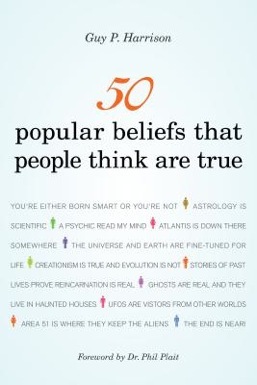 Ultimately, 50 Beliefs isn’t the success I anticipated because it relies on argument over evidence (discussed previously) but also because its scope is much too big. With 50 beliefs to cover in 40 pages, that only equates to roughly eight pages per topic, which isn’t nearly enough space to properly devote to each idea. If the idea behind this book was more limited perhaps I wouldn’t have felt so lackluster while reading and been more indebted to finishing it quicker. It was definitely a struggle to get through the majority of the material. Unfortunately for me, this book started to feel like an obligation more than a desire, which I never want out of my reading. I didn’t hate it, but I didn’t love it either. On the plus side, at least it was interesting and taught me a few fun facts as I read through it. And if I zoned out a few times when the same information was repeated, who can blame me?